A very convective cumulonimbus may transport substances, such as cloud particles, into the stratosphere, the atmosphere above 15 km high. However, its process is not well known. The aim of this study is to reveal the transport process. I visited and checked the Mt. Fuji station whether the measurement of the cloud above a top of cumulonimbus clouds, a jumping cirrus, is possible to carry out or not. 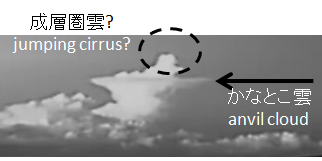 A jumping cirrus was first found by Prof. Tetsuya Fujita, the Univ. of Chicago, who is known as an inventor of the F-Scale of tornados. However, there are a few research papers after his finding since its measurement is not easy. A photo was taken by a camera of Prof. Kamogawa group, Tokyo Gakugei University. One cloud shooting out an anvil cloud looks a jumping cirrus. The ground-based radar showed its rain rate was 50 mm/hr. However it is not because of lower cloud top height. The important point of this photo is that a cloud top is clearly measureable from the Fuji weather station.